Some weddings are big and over the top, while other weddings can be classy and understated. If you prefer the idea of the latter style of wedding, the Angel Orchid invitation from Pure Invitation is likely to appeal to you. It has a high degree of functionality, allowing you to share the good news and all relevant information with your guests but it also has a great touch of class and style about. If you plan on having orchids as the flower of your wedding, this invitation is the perfect way to set the tone and theme for your big day. Coupled with a lace and natural binding, this is a collection that offers an elegant way to spread the news about your special day. One of the most pleasing aspects about this invitation is that it comes in a pack with space for all of the information you need. It can be difficult to combine the style and elegance you want for your wedding invitation with all of the relevant information that people need to know about your big event. This is why being able to offer a stylish invitation, alongside additional inlays or sheets providing more details about the wedding, is a great way to keep everyone informed with what they need to know. 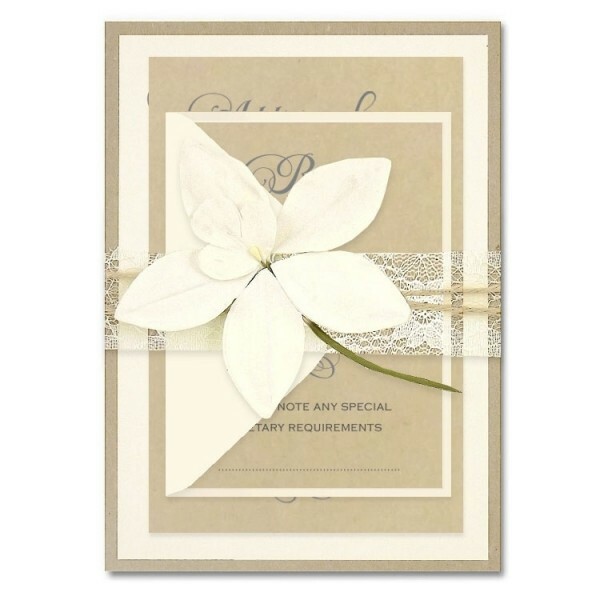 If you have a lot to say but want to say it in style, the Angel Orchid invitation is a great way to get the message across about your big day. For those who want to be as hands-on as possible with their big day, there is an option to assemble the pack yourself at home, taking care of all of the information. However, if you are pushed for time, the print service can be fully customised, allowing you to reach out to your guests in an easy and convenient manner. Tags: Kraft, Lace, Orchid, Twine.